Portfolio Re-balancing – An Overview. Home > 2-minute reads > Portfolio Re-balancing – An Overview. Why is Portfolio Re-balancing necessary? Portfolio Rebalancing is the process of changing the portfolio underlying holdings with an objective to restore the portfolio to its target allocation. While some investments perform well and take up more share in the portfolio, other due to comparatively underperformance lose share in the portfolio. Due to this, it is required to readjust the portfolio to ensure its original balance provided financial objective/goals is not altered. 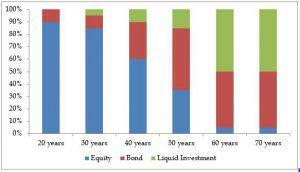 Assume you are a 25-year-old with a target allocation of 90% equity and 10% bonds. While equity continues to grow at a faster pace than bonds, the share of equity changes to 95% over time. 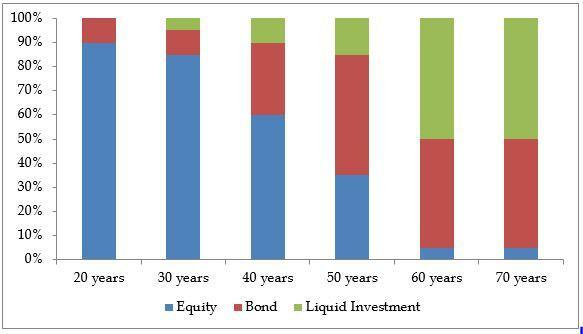 Given you are still young you can continue with higher allocation to equity, however, with time as your age increases your risk appetite reduces and thus your allocation to equity reduces and by the time you are in the senior citizen group you tend to allocate nearly 50% of the portfolio to liquid funds with minimal risk. Thus, in essence, rebalancing is the process by which you seek to modify your asset allocation as each investment fluctuates with the market. Note: The above is a generic pictorial representation on how portfolio allocation changes with time and in nowhere provides correct representation. An allocation is also a function of risk appetite, horizon among others. Liquid investment here indicates investment in liquid funds and fixed deposits, recurring deposits that are highly safe and liquid. How do we rebalance our portfolio? Automatically — through dynamic asset allocation funds or through third-party vendors that use a robo-advisory platform. Click here to check out ORO wealth’s robo Advisory. Determine your target allocation for each asset class such as equities, bonds, cash etc. In the example above, asset allocation target was 10% bonds and 90% stocks to start with. Compare your current portfolio allocation with target allocation. If there is considerable change in the portfolio and any asset class has become bigger, it needs pruning. Accordingly, buy/sell instruments in order get your target asset allocation. Once you reverted your portfolio allocation to its target, you have successfully re-balanced. Automatic rebalancing: Another way of re-balancing is to opt for auto-balancing offered by third-party companies such ORO Wealth that uses technology to provide the best solution based on your profile. Also, you could opt for dynamic asset allocation (AA) funds. Dynamic AA funds switch between equities and debt completely and invest depending on market behavior to ensure the holdings depict conviction at all times. To recap, asset allocation and periodic balancing are important to ensure the risk is controlled and the portfolio generates stable returns over the long term. Rebalancing is required given that the different asset classes provide different returns. For example, Nifty shot up 31% in 2014, closed 2015 with a 4% loss, increased 3% in 2016 and amplified to 29% in 2017. Likewise, returns from fixed income products have remained largely while on the other hand returns from gold have fluctuated significantly. Over time, the differential returns generated by these asset classes have resulted in significant change in asset mix of a portfolio. We firmly believe that rebalancing not only helps to generate stable returns over time but also provides an opportunity to sell positions at a higher price and buy at a lower price over time. While there are no specified timelines for rebalancing, we believe, it should be done at least once a year or during times when there has been significant market movement. Lastly, we believe an investor should pay much-needed attention to the tax consequences he/she may face due to rebalancing. Any redemption of investments could result in tax implication and thus it is important to take into account the cash outflow a person is likely to incur towards taxes. One of the ways to remain tax-efficient is to invest in instruments that are comparatively underperforming. If you are invested in mutual funds particularly equity type, it is wise to ensure the investment is in growth plan rather than dividend re-investment as it attracts dividend distribution tax. Drop a mail to connect@orowealth.com for any queries! We’d be happy to help.